Afternoon hunnies....been a busy week but have managed to stay on top of it...my card is pants..i really am not sure what mode of thinking i was in when i couloured this hahah ... im at the moment trying to find a nice layout inside this jumbled mess of a head for a commission i have been asked to make for a anniversary oh dear mojo gone awol again...but im off later to hobbiecraft just for a look!!! yeah who am i kidding but in need of retail therapy amongst other help!!! plus bits for my candy!!! not the eating variety but Birthday Candy!! i will be posting my goodies up for grabs later so watch this space....this card is all wrong but hey ho..i treated myself to some stamps from Kanban..really loved the design i saw them on some eleses blog and they looked superb.. really great cards but cant remember whos?? but as im not a stamper im not so sure it was a good investment but had a go anyway i stamped them up(not bad for me) and coloured with polycromos added free papers from a craft mag flowers fromWild Orchids a couple of pink feathers and of course a bow.or two ..and this is deffo one for the charity box or i mught take it too bits and re-vamp ? I think you need to pop into Specsavers for an eye test while you're out,lol!! This card is gorgeous! Wow! I can't believe you don't love this !! it's gorgeous! what a sweet image and fab layout. 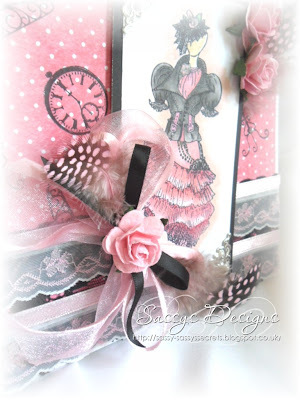 I love the pretty papers and the flowers and lace - all So pretty! it looks perfect! This is one stunning card!!! Just look at that image - it is beautiful and so beautiful!!! 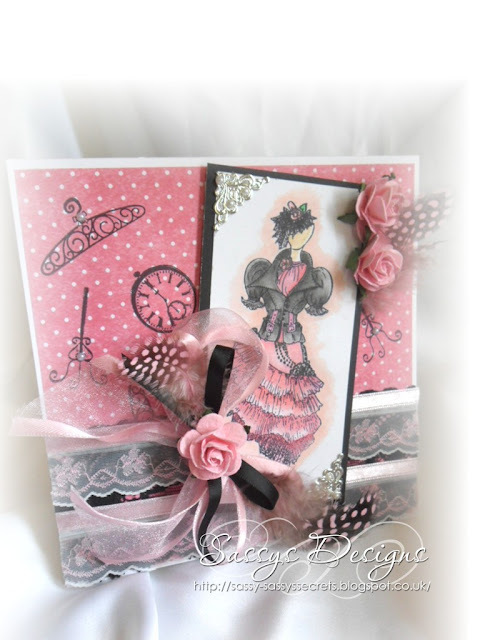 Your details are all gorgeous - love the feathers!!! This is gorgeous. I love the image and colours and the feathers are great.